The income of all lone-parent families increased between 1990 and 2010. 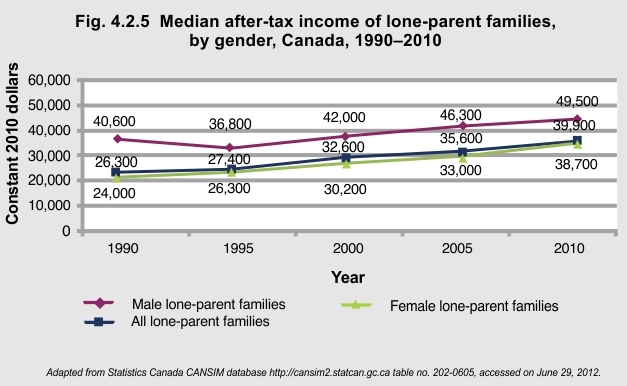 During that time, female lone-parent family incomes increased by 38%, to $38,700 in 2010 from $24,000 in 1990, whereas male lone-parents family incomes increased by 18%, to $49,500 in 2010 from $40,600 in 1990. Although female lone-parent family incomes increased significantly, their average after-tax income was almost $11,000 less than their male counterparts in 2010. 1Statistics Canada. The Daily. http://www.statcan.gc.ca/daily-quotidien/110615/dq110615b-eng.htm, accessed on June 29, 2012.